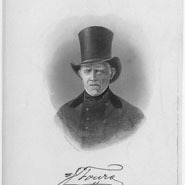 Judah Touro was born in Newport, Rhode Island, where his father, Isaac, was the cantor of the Jeshuat Israel, later known as the Touro Synagogue. His father had also supported the British during the Revolutionary War and departed for Jamaica soon thereafter. Touro and his mother relocated to Boston, where he soon died. Judah worked for his uncle, the successful merchant Moses Michael Hays, and left for New Orleans in1802 to seek his own fortune. Touro soon built a thriving mercantile business trading with New England. Touro became a dedicated philanthropist, endowing a cemetery, a synagogue, almshouse, infirmary, and a church for a minister whom he greatly admired. When Touro died, his estate provided endowments for nearly all the existing Jewish congregations in the United States.